Find out what makes Santorini so special, explore its sunny, whitewashed alleys and immerse yourself in the Cycladic brio and cosmopolitan lifestyle. This one of a kind town, hanging leisurely over the Aegean Sea unravels its secrets in every step you take; a different view, a new spectacle, carefree people and elegant shops, cafs, restaurants and bars. Every day is a new experience, every picture is a new memory, and every step is a new adventure. Modernity Suites is in the center of all this, surrounded by the exhilarating esprit of Santorinis Fira. Its convenient location, its private balconies with the jaw- dropping views and the private Jacuzzis, its stylish dcor and the outstanding services it provides make Modernity Suites the perfect accommodation choice for the visitors of Santorini who want to see it all; experience it all; who want to be one with the unique spirit of this truly amazing island. The Junior Suites of the Modernity Suites complex is the perfect choice for a couple or two friends who seek comfortable accommodation without being away from the vibrancy of Fira. 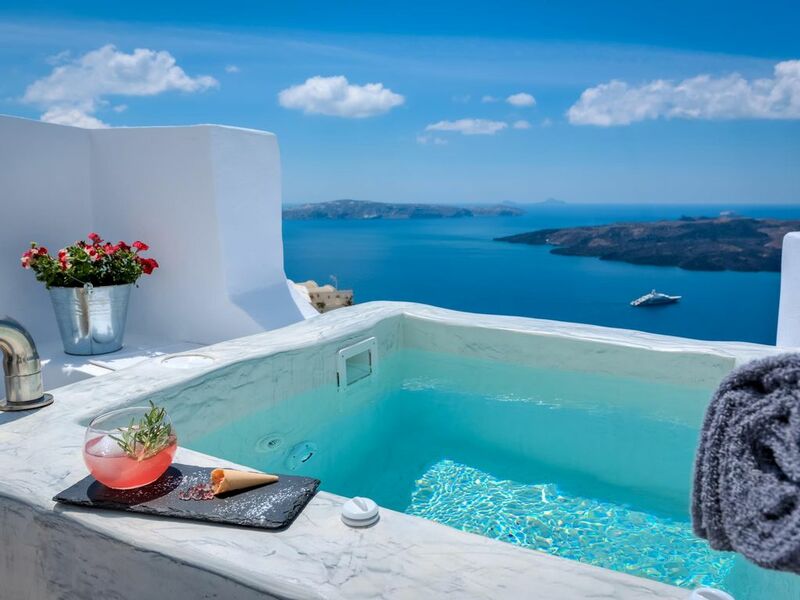 Find your heaven of elegance and comfort in the welcoming Modernity Junior Suite and admire unobstructed views to the volcano and the Aegean from your Jacuzzi in your private balcony. Modernity Suites are very easy to locate. Wherever you are coming from the port or the airport, head to Fira and find the central square where you can park your vehicle and follow the alleys leading to the caldera. Modernity Suites are close to the Archaeological Museum and Santozeum, with the entrance being next to the Idol Caf- Restaurant. The bus terminal is just a few meters away as well as the taxi station. The attractions of Fira are located within a few steps, whereas the famous village of Oia is only 15 km away and the nearest beach, Exo Gialos, is 2 km. from Modernity Suites. The active volcano of Santorini erupted in the 50's and ruined many towns of the island. Santorini is also called Thira and its capital is the town of Fira. It is a very touristy island and therefore rather expensive. The locals live mainly off agriculture and tourism. The islands largest export product is soil +-- ---- ---- tons a year are used all over the world, mainly to make concrete. The Suez channel was built with this concrete for example. Most holidaymakers stay where the beaches are, Kamari and Perissa, but these places really do not represent the island's amazing distinctiveness.